Tourism Secretary Ace Durano, Doctors Antonio Alfonso, Christian Cumagun, Rex Bernardo and Karen Davila have been awarded The Outstanding Young Men (TOYM) trophies by Philippine President Macapagal-Arroyo. Durano was awarded for eco-tourism, Alfonso for Science and Technology, Cumagun for Agricultural Science, Bernardo for Community Service and Davila for Broadcast Journalism joining close to 400 recipients of the prestigious award set up in 1959. The winners were announced by Isabela Gov. Grace Padaca, this year's Ramon Magsaysay awardee for government service. "The Filipinos are not desperately seeking modern heroes. Everyday heroes abound in our country,"' Albert Raphael Angelo Lesaca, national president of Junior Chamber International Philippines, which gives out the TOYM Awards, said in his message. Alfonso, 40, heads the Philippine Rice Research Institute Plant and Breeding and Biotechnology Division, according to his profile. As a Ph.D. student and part of a team from Cornell University, he worked on the successful cloning and functional characterization of a plant gene, called Restorer of Fertility (Rf), a big stride in determining the nature of the Rf gene. At PhilRice, he is applying new knowledge on the nature of Rf genes to fast-track the development of superior hybrid rice varieties. Cumagun, for his part, has made several landmark achievements in agricultural research. He was the first to molecularly characterize Philippine Trichoderma strains, a bio-control agent fungus against several plant bacteria, to reduce pesticide use in agriculture. "Tony and Christian, the scientists of our batch, they're literally feeding millions,"' Durano, who spoke on behalf of the awardees, said of Alfonso and Cumagun. "They're the real miracle workers.'" Through their researches, Alfonso has created a rice variety that is immune to disease, while Cumagun has ensured the immunity of rice against disease, according to the Durano. Bernardo, 38, has overcome polio to complete a Bachelor of Science in Psychology degree at the Trinity University of Asia and at the same time, empowered students with disabilities to be integrated in the mainstream student population, as well as the faculty to build disabled-friendly facilities inside the campus. Holding three Master's degrees in developmental management, human resources management, and industrial relations, he teaches accounting at the Mabini Colleges, and volunteers for Gawad Kalinga in Daet, Camarines Norte. He also champions the rights of the youth with disabilities. "This `inner power' of his he has has used to inspire others to find their own inner powers,"' Durano said of Bernardo. Davila, ABS-CBN news anchor and dzMM radio host, managed to marshal her beauty, talent and drive in using TV and radio as a tool for education and instrument for change, according to her profile. Off-camera, she walks the walk, using her celebrity status and influence for advocacy work in organizations such as World Vision and Habitat for Humanity. "Karen, the celebrity of this batch, has used her voice to give a voice to the voiceless especially, the marginalized children of the country. And she has done this through numerous advocacies, and programs,"' Durano said. Durano,38, a former Cebu congressman, has rationalized the country's tourism drive, formulated well-focused campaigns, and launched ecological tourism programs ``that market the vibrancy and natural endowments"' of Philippine travel sites. "As for myself, by linking the welfare of the rural communities and the welfare of the environment that they inhabit, we've been able to achieve prosperity for these rural communities and prosperity for the environment that they inhabit,"' he said. 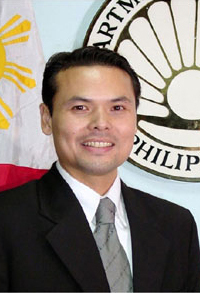 He cited Ms Arroyo for empowering him in his position. According to him, the five awardees share a common spirit and a sense of direction.